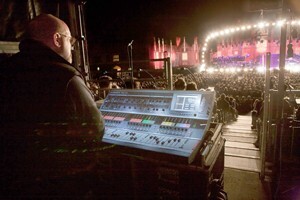 Two Allen & Heath iLive digital mixing systems were used at FOH for a lavish production by prog rock legend, Rick Wakeman. Staged at Hampton Court for two sold-out nights, Wakeman performed his seminal 1973 album, The Six Wives of Henry VIII, to mark the 500th anniversary of Henry's ascension to the throne. Months in the planning, the high profile event included a full choir and orchestra, church organ, grand piano, the English Rock Ensemble band - including Wakeman's son, Adam, on keyboards and renowned percussionist, Ray Cooper - performing an extended version of the concept album, with narration from special guest, Brian Blessed, six wives, and a selection of ostentatious costumes. Ian Barfoot, Rick's FOH engineer for nearly 25 years, selected two iLive systems, an iDR10 MixRack and iLive-80 Control Surfaces to manage the individually-mic'ed choir and orchestra, fed to a second, main FOH iLive system comprising an iDR10 MixRack and iLive-112 Control Surface. All connections between the iLives and the loudspeaker management systems were carried out in the digital domain using the iLive digital I/O option cards to preserve the audio quality. "With a 50-strong orchestra, 30-member choir, and a full band including multiple keyboards, there was a lot to manage. However, iLive coped admirably and we didn't require any additional outboard equipment, unless you count a CD player for BGM!" explains Barfoot "Working with musicians of this skill and talent requires very little effort - they only need space to shine - and iLive does that with ease. iLive's simple user interface, excellent analogue-like sound and classic-sounding onboard FX are a major contribution to creating a first class production." The PA system was supplied by Manchester-based Wigwam, and included a d&b line array, a Digico mixer on monitors, and one in a recording truck to feed an American broadcast company and mix the live CD material. Approximately 150 Varilights, 400 generic lights and three giant Barco projectors were used to light the historic building and stage. Telemetry from seismic sensors attached to the building were monitored to warn of possible damage to the priceless facade from low frequencies generated by the instruments on stage. Wakeman is planning a second special concert, a performance of the original ‘Journey to the Centre of the Earth', next spring, to be staged in another iconic London venue. "I hope I get to use iLive for that show also," adds Barfoot. "It is an even more complex piece, which iLive would handle without difficulty."